Lynda Grace An Hour Away: A-Z April Challenge Q is for "Hello, Will You Hear Me Now?" Thank you Lee. I have been visiting new blogs every day too and have, of course found some great ones. I am going to check out all of the ones you listed today. I am also known for being quiet. As an introvert it's often misunderstood or mistaken. I get a lot of questions like, "are you OK?" "Why don't you talk more?" I talk when I have something to say. Not a lot of people get that. Great post for Q =). I completely understand what you mean when you say that you talk when you have something to say. I feel the same way. I'm not quiet by nature, it's something I have to work at! I learned a long time ago that it was worthwhile to listen to the people who don't always interact in a group. When I led a school work team, we always included a time in our discussions to give time to speak to those who hadn't previously spoken. I learned a lot from those who listen rather than fight to be the center of attention. I'm your newest follower and a fellow AtoZ participant. Thank you. Your comment touched me. It was very sensitive of you to consider those people who may need a little encouragement to speak. Sometimes I was I was a quiet person. It would keep me out of trouble. Quiet is not a word many would use to describe me, I think. And in spite of that, I can relate to the struggle to begin conversations and interact in a group. 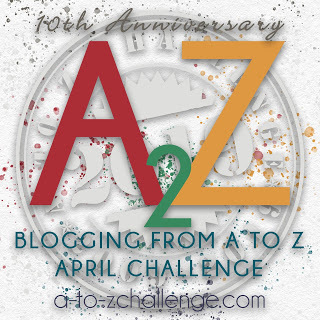 I'm glad I've found your blog through the A to Z Challenge and I look forward to reading more! Yes, I know that even outgoing folks may feel uncomfortable speaking to a group of people they don’t know. The photo in your tribute...Joe looks like such s sweet kid, and yes, he looks shy, like he wasn't excited to see a camera point his direction. :-) Some people are just like that. And that simply adds to their beauty. It was a beautiful post, Lynda. There is a special relationship between a mother and her children. I don't believe it's ever severed, and I think it exists beyond our earthly horizon. You are a strong person. A big hug to you. Thank you Teresa. It is so true about the bond a mother has with her children. I also know how it feels to lose a mother and how much more I appreciate what mothering means. I am the worst of both, I am a shy introvert. It is very hard going through life in that state. I am usually considered, snobby, or another name. People are not very understanding of shy introverts. My daughter is an introvert but not shy, which I am thankful. You might enjoy this book: "Quiet: The Power of Introverts in a World That Can't Stop Talking." My daughter did a presentation on the the book for her professor and the professor was so impressed she is having her present it to the entire class and going to add the book for a reading assignment. I do have the Quiet book. I have not had a chance to read it, but I intend to. It is very neat that your daughter chose that book to do a presentation on. It was also very smart of her professor to recognize her efforts. I'm not sure if I'm a quiet person by nature, but I love the sounds of silence. Popped by from Arlee's AtoZ post. I too enjoy a peaceful and quiet time. Thanks for the visit, too. I don't know many quiet people, actually. I wonder if that's just coincidence or if quiet people are attracted to other quiet people and not those who are more vocal. I'm not a loud person, I don't think, but no one has ever described me as quiet. How interesting that you don’t know many quiet people. Interesting and understandable, though. We are not that easy to get to know. I think I have something of a split personality when it comes to the quiet/boisterous thing. I can be very quiet to the point of shyness with people I don't know, but can go too far in the other direction with people I'm comfortable with. Beautiful post about Joe. Thanks for linking to it; glad I got the chance to read it. I guess I am a little like that too. I am most comfortable with people I know or in a one on one conversation. Quiet. I've had a very loud week, and I'm looking forward to the quiet of the weekend. I hope you have a very peaceful weekend. Lynda, I found your blog today, and I am glad. I am a quiet person as well. I am in a quiet season of my life. Your blog is a welcome place to visit. Thank you. Thank you, Susan for your kind words. I like what you wrote, that you are in a quiet season of your life. I am glad that you visited.